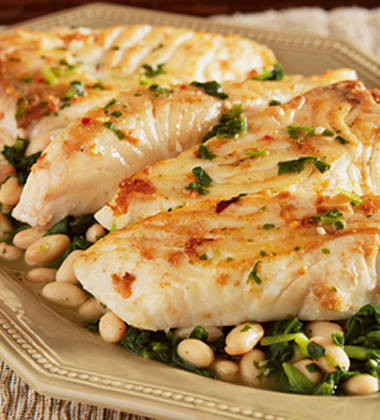 Tender halibut fillets are served on a delicious bed of seasoned spinach and great Northern beans sautéd in Swanson® Unsalted Chicken Broth to make a quick-cooking, restaurant-style dish. garlic, peeled, minced	 0 oz. 2 tbsp. halibut fillet	 9 lb. 24 ea. 1. Stir oil and the garlic in a shallow hotel pan. Add the fish and turn to coat. 2. Heat the remaining oil in a skillet over medium-high heat. Add the fish and cook for 4 minutes or until lightly browned on both sides. Remove the fish from the skillet. 3. Stir the broth and lemon juice in the skillet and heat to a boil. frozen spinach, chopped	 66 oz. 3 qt. 4. Add the spinach, beans and red pepper. Return the fish to the skillet. Reduce the heat to low. Cover and cook for 2 minutes or until the fish flakes easily when tested with a fork. CCP: Heat to 145°F for 15 seconds. 4. To Serve: Using a 4 oz spoodle, portion 1/2 cup spinach and beans with 1 halibut fillet. garlic	 0.25 oz. 2 tbsp. frozen spinach	 66 oz. 3 qt. 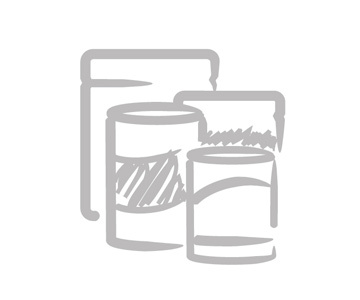 This recipe meets Partnership for a Healthier America nutrition standards (a la carte entrée).